A little planning goes a long way when you are heading out on a road trip. Have you ever been miles away from your home and then realized you had forgotten something important? Or maybe you are saying to yourself, “I wish I would have brought that!”. It’s happened to me too many times than I can count. Before I head on a road trip, I organize and make lists. Being ready makes the trip more enjoyable and less stressful. 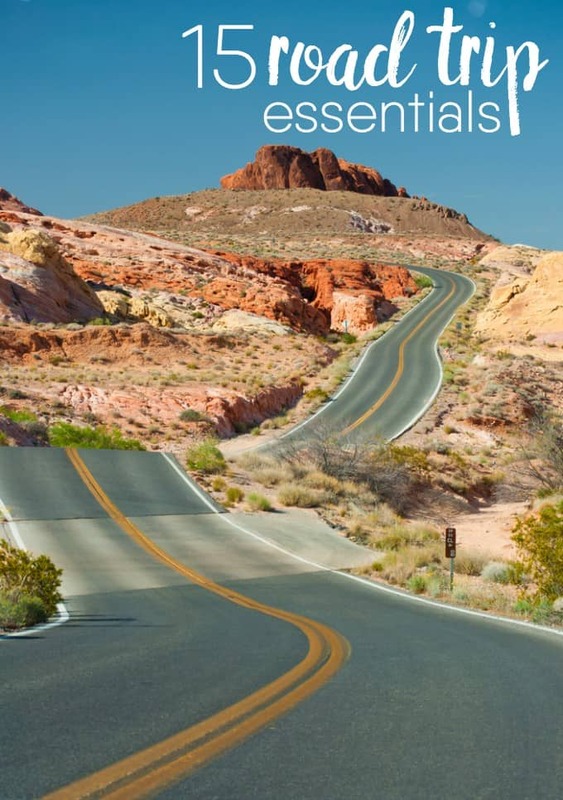 I’ve compiled a list of 15 road trip essentials to bring with you next time you head out. 1. Pillows. I dig out our travel pillows we bought years ago at the airport. If you don’t have any, bring a pillow from your bed. It’s a million times more comfortable than leaning your head against the window or sleeping sitting up. Trust me, I know because I can fall asleep sitting as normal in the passenger seat. I only wake up when my head bobs down to my chest! 2. Breath mints. After you’ve had a snooze in the car, you’ll be wishing you had a breath mint to combat your horrific breath. Even if I’ve slept for only an hour or two, I always wake up with a bad taste in my mouth. To save myself from listening to John’s complaints due to his super sonic sense of smell, I always have some mints in my purse. 3. Roll of toilet paper. Because when you gotta go, you gotta go. If nature calls when you are in the middle of nowhere, sometimes you have to go on the side of the road. It’s not ideal, but it happens. Rather than using the fast food napkins at the bottom of the bag of your recent meal, bring some toilet paper. I always leave a roll in my car because you never know…. 4. Small garbage bags. It has to go somewhere and a garbage bag is a much better option than the floor of the vehicle. Bring a bunch and you can throw them away when you stop for gas. Keeping the car clean means a more comfortable trip. 5. Gravol. Car sickness happens. Nothing can ruin a trip more than when you feel like you are going to puke the whole time. Gravol has saved me a few times in the past. After taking it, I fall asleep and wake up feeling a million times better. I also use it for migraines with nausea. It takes the horrible edge off the pain. 6. Baby wipes. No baby is required! Baby wipes can be used to wipe off dirty faces and clean up sticky fingers so everyone feels a bit cleaner and fresher. 7. GPS. Don’t leave home without it! If you’ve never been to your destination before, your GPS can save you the hassle of reading a map or wrong turns. They are worth every penny. 8. Car emergency kit. If you ever break down on the side of the road, you’ll be grateful for packing this essential kit. Hopefully, you won’t need to use it, but it’s there if you need it. Pack one for peace of mind. 9. Cell phone charger or portable battery. Our vehicle has a USB port so I can charge my phone as we drive. I like knowing it’s there in case of an emergency if we need to call a tow truck. I also use my phone via Bluetooth to listen to music. 10. Entertainment. Road trips can be long and boring. Bring some good tunes or audiobooks to pass the time. Before you go, research some fun road trip games you can play. 11. RUB A535. When sore muscles strike, you’ll be wishing you brought some RUB A535. I like using it on my neck and shoulders after being cramped in the car all day. It soothes my muscles and makes me more comfortable. 12. Snacks. Think ahead and pack snacks. Non-perishables like granola bars are great to have on hand to satisfy hunger pangs. If you are packing anything perishable like fruit, veggies or sandwiches, bring a cooler. 13. Bottled water. I’m not a big fan of bottled water, but I like having a case in the trunk for road trips to stay hydrated. Plus, it’s a healthier option than bringing a case of pop. 14. First aid kit. Keep one in the car at all times especially when you head on a road trip. It’s better to be safe than sorry. 15. Change for tolls. Canada doesn’t seem to have that many toll roads, but the USA? They have a ton, at least in my experience. Bring small bills and change so you can zip through them quickly. What other road trip essentials do you suggest bringing? All great items to make sure you have & I agree 100% with the toilet paper. We have been in that situation a couple times and were digging through the car to find something. So we know have a roll stashed in the trunk! I’m a list maker too, I find it essential to make sure I have everything needed. I think that you’ve thought of everything Stacie. 🙂 Having a first aid kit in the car is the law in Germany, and expiry dates are checked when the car has to go in for it’s road-worthiness test every 2 yrs. I don’t like regular water either. I do like those sparkling Ice drinks, and those fancy fruit waters too. No sugar and no calories! I think you have everything just about covered. Lots of practical info here. Yes for toilette paper!! these are great tips, I am in the process of planning daily road trips for a week in July, if I don’t start now the time to go will be here… HAHA! Super sonic smell! !